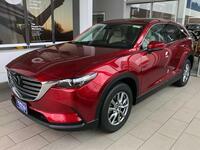 The Mazda CX-9 is the largest crossover SUV in Mazda's lineup. It has three rows of seating to give it a seven-passenger seating capacity and features a long list of equipment to appeal to families. Aside from its luxury styling and materials, the 2017 Mazda CX-9 features a responsive engine with impressive fuel economy. The 2017 Mazda CX-9 is available now in Brookfield, WI at Hall Mazda. Take a look at what the new model year brings the three-row crossover. The 2017 Mazda CX-9 is available in four models Sport, Touring, Grand Touring and Signature. All models are powered by a 2.5-liter four-cylinder engine that produces 250 horsepower and is paired with a six-speed automatic transmission. While front-wheel drive is standard, all-wheel drive is optional for customers. The Mazda CX-9 is able to tow up to 3,500 pounds which is great for families with places to go and the 22 city mpg and 28 highway mpg gives them more time for fun and less time at the fuel pumps. The 2017 Mazda CX-9 is packed with numerous safety, convenience and technology features. The base Mazda CX-9 Sport starts off strong with a long list of standard features including tri-zone automatic climate control, a rearview camera, Bluetooth, a 7-inch touchscreen, a six-speaker sound system, a leather wrapped steering wheel and shifter and more. Choosing other trims adds features such as heated mirrors, a power liftgate, keyless ignition and entry, leather seats, a sunroof, ambient lighting and more. Some features available on the Mazda CX-9 are not even available on other comparable SUVs on the market like Heads-Up Display which shows the driver important information such as navigation right in front of the steering wheel on the dashboard so that the driver can see the information while keeping their eyes safely in the direction of the road. The 2017 Mazda CX-9 is available now at Hall Mazda in Brookfield, WI. Please contact us if you are interested in more information on the Mazda CX-9 or if you would like to schedule a test drive.